Jens erik er í fínum selskapið, nú UEFA ger burturúr teimum fáu, ið enn spæla á hægsta støðið, eftir at teir hava rundað tey 40. Um Jens Erik verður skrivað:Asked whether he was starting to feel his age on the pitch, the 43-year-old Rasmussen said: "When you are older than several of your team-mates' fathers, that is inevitable." 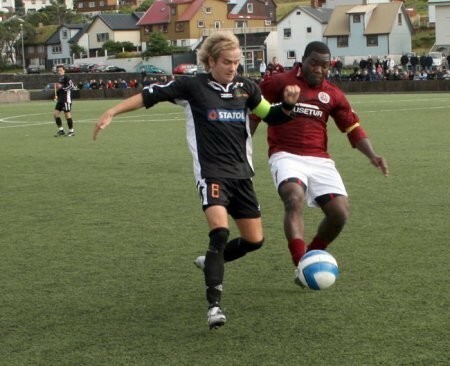 The forward and midfielder, capped 25 times, has been playing for 26 years, and while 07 Vestur were relegated in 2011, the Faroese league may not have seen the last of the skilful Rasmussen – who played abroad with AC Horsens and Esbjerg fB in Denmark and Icelandic side Leiftur. "Because I'm quite slight, it is probably easier for me to keep in shape than for someone who is big and strong," he noted.